This pub has been voted by our readers as one of the best in Marylebone. See the full list of winners here. This little pub on Marylebone Lane stands on a former bank of the River Tyburn. The river is long-gone, but you can easily trace its route by looking at street plan and following the curvy lanes and alleys through the otherwise grid-like Marylebone and Mayfair. 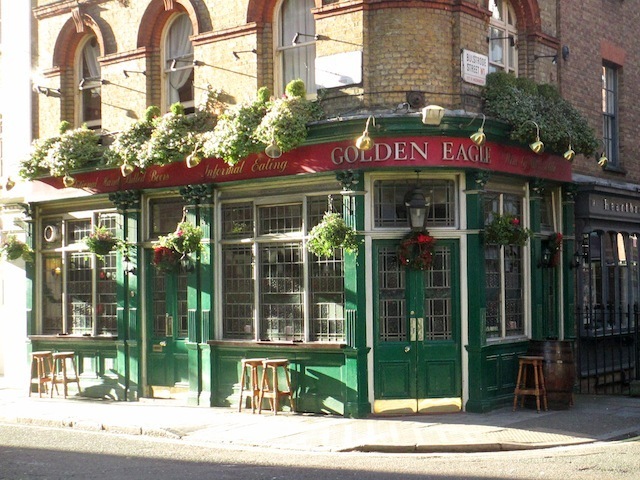 The Golden Eagle retains something of a vanished London, and feels splendidly out of place in one of the most well-heeled parts of town. Stained windows and ageing carpets mark this out as a pub that's avoided the gastro pitfalls others have fallen into, and indeed there's not much food to speak of. There is, however, a piano in one corner of the pub, which takes up a bit of space in a place this small but you can imagine the riotous nights it will have led in the Golden Eagle over the years. A Saturday night piano player named Gina is indeed available for hire. An ornate umbrella stand by the doors — containing actual umbrellas — is one of the unique aspects of this place, as are the hobbit-height catacombs that lead to the toilets beneath. With three or four draught ales and an 'exciting, sensual yet uncomplicated' wine list, the drinks range is good enough, though nothing magical.